As expected, an array of answers were provided. Nicholas Feltron likes to travel. Michael Place from Build provided a recipe and recommended two glasses of wine. Jil Lee cleans. Erik Spiekermann suggested: avoid, think, research, collect, sketch and deconstruct. Chad Hagen, honestly admitted what has kept him inspired is his desire to be good, like really good. As someone who is driven by competition, this answer really resonates with me. However, my favorite answer came from Mike Perry who said lately when he’s in a rut, he’s been taking the Amtrak somewhere. This reminded me of an ITP assignment that Red Burns gave the incoming ITP class after mine, that I always wanted to try: take the bus from the top Broadway in NYC all the way down to the bottom and write about your experience. People watching has got to be one of the greatest creative block breakers of all time for me. 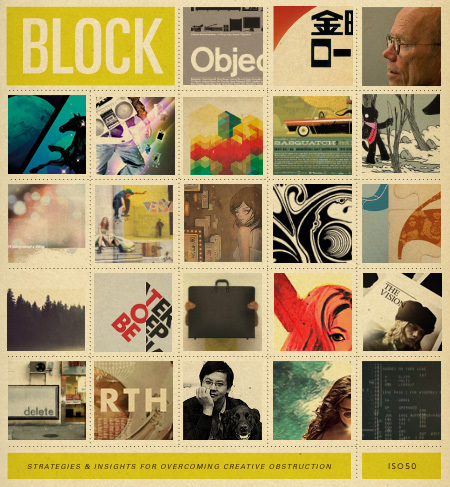 Creative blocks are hard, and as an art director i am in constant debate with my brain. I got this book though “Midday Crisis” from http://www.middaycrisis.com and it’s truly superb. Straight n simple kick starters to get you out of a rut!!! Two thumbs up!